The Complete Recording Studio with Mac mini v7 (MGEM2LL/A) provides all the hardware and software you need to write, compose and record your music from start to finish. With the power of Pro Tools First, Ableton Live Lite, GarageBand, and a collection of top-brand plug-ins from Focusrite, Softube and Avid; including compressors, equalizers, effects, guitar effects, instruments, modeling software, vocal processing and synths, you have the all the creative control you need to sculpt your music without limits. 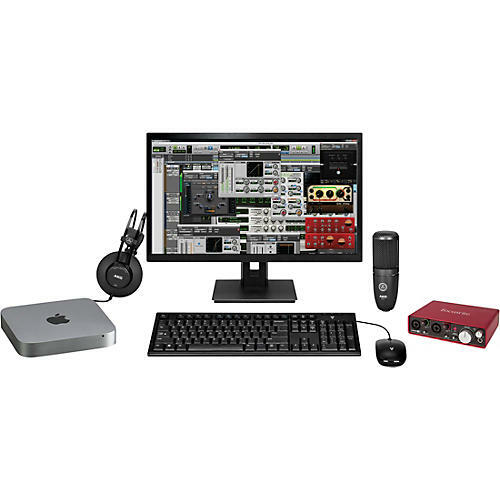 Bundle includes Apple Mac mini, 21.5" monitor, Focusrite Scarlett 2i2 audio interface, AKG P120 studio microphone, AKG K52 headphones and more. So check out the Complete Desktop Recording Studio and free your musical imagination today.